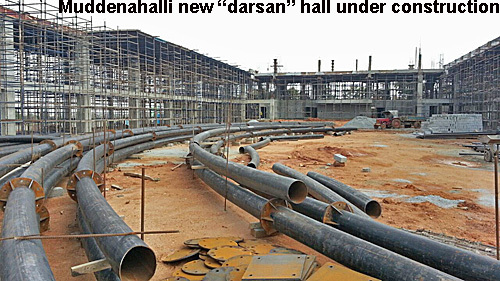 The new hall being built at Muddenahalli is called a ‘darshan’ hall. A visitor remarked, “I thought “Darshan” meant “SEEING someone” but they seem to have redefined it to mean “The imagination of seeing something”. The ridiculousness of stretching the imagination!! Sadly, the devotees can only do this in .0001% of the lies sb constantly told. All the other lies have never found “fulfillment,” despite the amount of stretchy-ness one might have. Indeed, it could at best only be designated a ‘Subtle darsan Hall’! What do these bogus spiritual entrepreneurs mean by “subtle baba” – some kind of immaterial spirit that comes and goes? No, they explain it as basically a body just like a physical body, that does not disappear into the astral world and return, but it has to travel by car and bus to get anywhere just like a physical body. Thus, the “Swami is coming, Swami is going” mentality. So the ex-student Madhu Sudan who parades as Suksma Sai, must be inhabited by a second body, (otherwise he must have been eliminated and taken over totally by Sathya Sai Baba?). It is promised “subtle baba” will remain only until “age 96” (by solar reckoning, not lunar years any longer!). But if the scam continues to be as successful as it seems now, the bets are off whether they will update this till another future date (of course, proving it is really Sai Baba because conveniently changing his mind and being unpredictable and lying was his signature personality). As Muddenahalli crisis is further deepenening creating an utter confusion to devotees of Sri Sathya Sai Baba, Prof.Anil Kumar, the blessed translator for over 3 decades makes a humble appeal to the Muddenahalli group to follow Swami’s teachings and bring in unity amongst devotees instead of creating division in the Organisation. ‘Wisdom eyes’ in our hearts’. Go tell that one to the Marines! Those who follow Sai Baba and most other Hindu gurus exist in the mental equivalent of delirium that they do not recognise because they have been entrapped from childhood in a sphere of unfounded beliefs and handed down superstitions. A large section of the Indian population share a culture of this kind, which of course also has counterparts in other mainstream religions. This entry was posted on August 10, 2015 at 10:19 am	and is filed under Sathya Sai Baba. Tagged: Madhusudan, Muddenahalli subtle Baba, Suksma Sai. You can follow any responses to this entry through the RSS 2.0 feed. You can leave a response, or trackback from your own site.